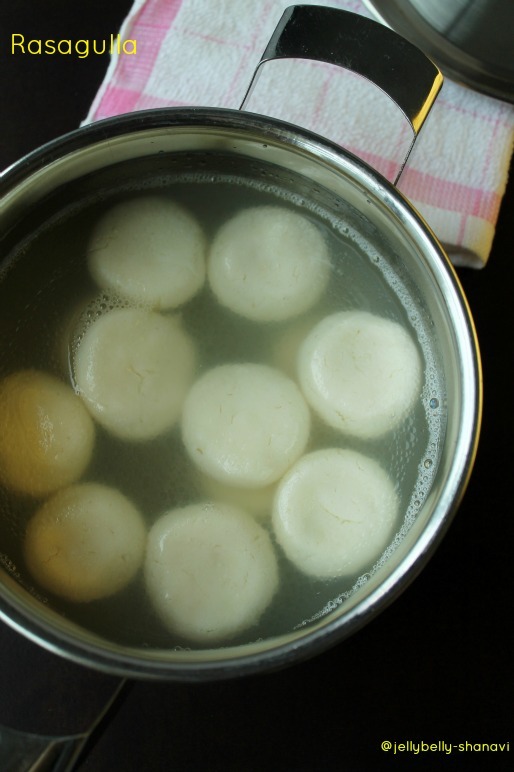 Rasgullas are the traditional sweets of Orissa for centuries now and it is popular thro' out India. This dish i s mainly made from indian cheese, paneer ,floating in sugar syrup. It's a very simple recipe if u have paneer n hand. I had a gallon of milk left &amp; while i's thinking what to make, i came up with this wonderful recipe of Manjula aunty. 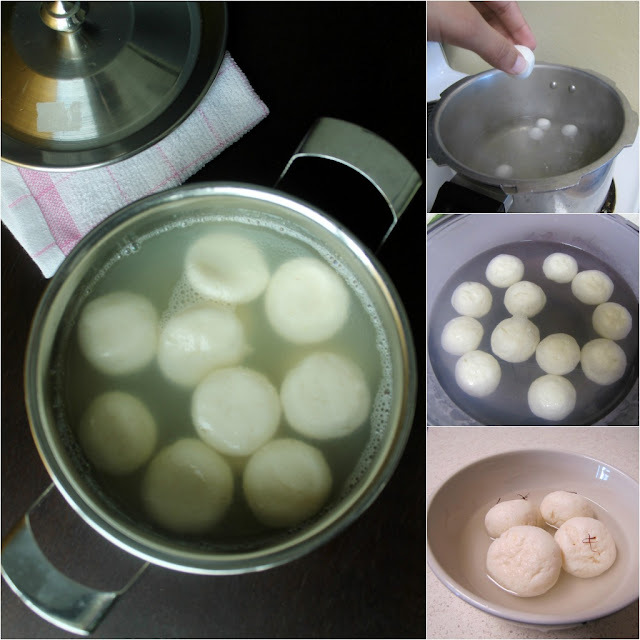 Just give it a try u'll know how yummy it is..
Bring 4 cups of milk to boil in medium heat and add the lime juice slowly. At this stage the milk will start to curdle and the whey will float on the top. Keep stirring it for 3 to 4 mts.Now drain this into a cheese cloth placed in a colander.Squeeze out as much water as u can(leaving little bit moisture so that our paneer won't b dry). Hang the cheese cloth on ur tap for half an hour or u can place a weight on ur cheese cloth just like i did. 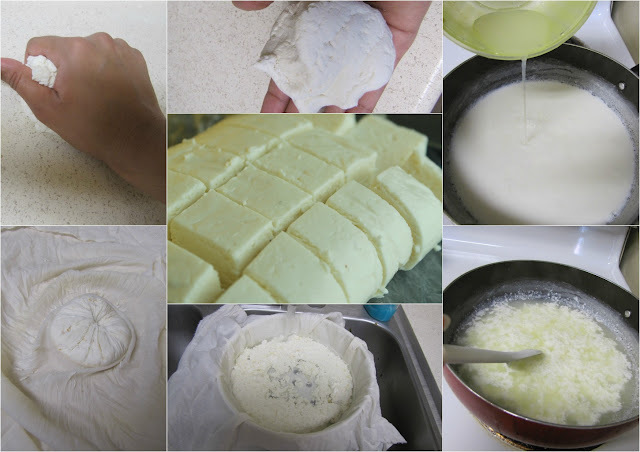 Once it is drained remove the paneer and place it on a dry surface and knead for 5 to 6 minutes until paneer becomes a soft dough. U can either keep this in the freezer or u can pour little water along with paneer to store in the refrigerator. Once refrigerated, u can make better cubes and store in the ziploc and freeze. Either way it's good. Fill ur pressure cooker with 4.5 cups of water +1.5 cups of sugar and boil it in a high flame. Roll the paneer as u roll for chappathi and divide that into 12 equal parts .Convert them into balls. Drop this paneer into the syrup once it started boiling. Close the cooker and cook for 7 minutes. Make sure, u use the big wide cooker since the paneer will expand when cooked. Open the cooker after the pressure is gone and transfer to a bowl. Do not keep it in the refrigerator directly. Wait for few minutes until it becomes luke warm and place inside the fridge. Serve chilled. Linking this post to the event Celebrate Sweets hosted by PJ ,event started by Nivedita of Nivedita's kitchen..